Ever wanted to make a career switch? I’m itching to! I’ve been a writer for most of my career and I know I’ll be a writer till the end of my days, whether I’m making money doing it or not! But lately I’ve been thinking more about my “buying and selling” hobby. It is just a hobby, but could it be more? 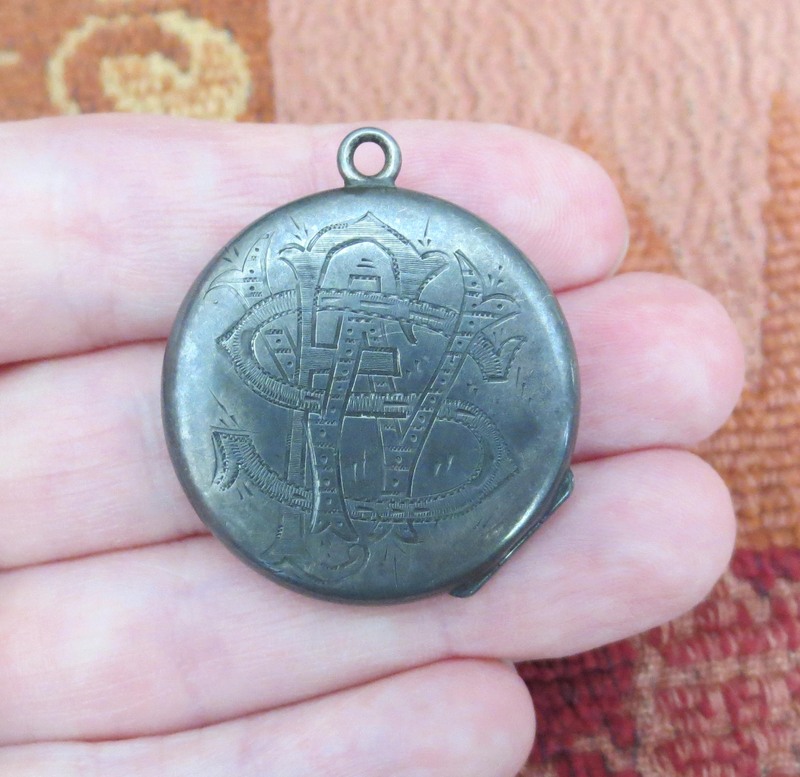 Wiped a bit of the tarnish off this old sterling locket to reveal the initials. The truth is I LOVE searching for cool vintage things to sell. It’s a rush. At an estate liquidation sale it means pushing aside the tube socks, old Tupperware, crusty slippers and digging out the bags underneath a bed to find a lovely piece of pottery or needlepoint. It means seeing the value in the heavily tarnished locket that several folks had already passed up as worthless, but is indeed old sterling silver and quite lovely. At a yard sale, it means quickly scanning tables of Target wine glasses, baby clothes and Danielle Steel novels to spot the cool Fat Lava vase from Germany or the dusty tramp art picture frame. But can I quit my part-time day job? If I’m honest, the answer is no, or at least not yet! At one or two sales a week, my store profit is just too small. But if I can improve my sales dramatically, say to 10 or 20 a week, it might be a possibility! But then of course, I would need to be buying a lot more, have a better storage system and get the accounting piece nailed down. Phew! I’m seeing it’s a bit of a catch-22 if I’m still working. Well, I’ll keep plugging away at it and be inspired by folks who have made buying and selling their career, like Laura Mae and Amanda Jean and Jay and Ryanne. How about you? Have you ever stepped away from a steady job to pursue your own business? Followed some passion or dream? Or wished you could? How about going to work for Kuzack’s Closet for awhile and learning the ropes??? I undeerstand she is hiring..